Try giving them dry yucca, the budgies and tiels LOVE those 'kabobs' with a passion! I came home last night, after dark, from my day at the rescue. Nicky's cage was open in two places and Ocean's chop bowl door was opened. Looks to me like Nicky opened up the food bowl door, and then opened his main door from the outside. He probably opened Ocean's chop bowl door from the outside, too. These "New Locks" on the Kings Cages are pretty bad. The cant just be closed, the have to turn all the way to "Lock" or a smart bird can easily get out. 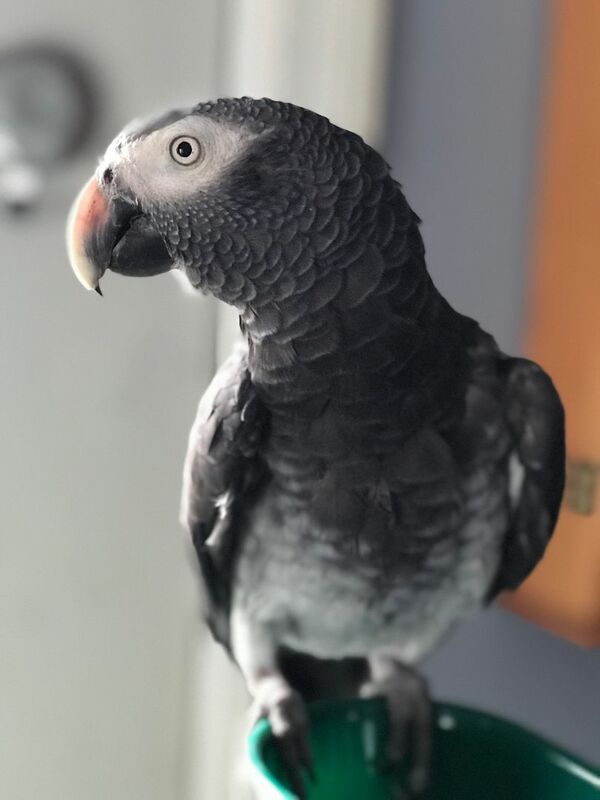 We have a two-year-old Scarlett at the rescue who escapes his cage every time one of the 5 doors with those locks (4 food bowls and a breeder door) is not left on lock. He then opens all the doors from the outside. We watched him do it on security camera. He simply reaches his beak through the bars and pushes the latch in. The doors all look closed and latched, but it they are not turned to lock, they are useless. Sweetie Cockatiel would hold open the cage door so Bubba could go out. Most of the time she would not open it to let him back in. 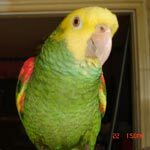 Lovebird Tweetle Dee use to open his door and come out to do a dance that I could not get him. By the time I got to him he was back in land pretending "I know nothing". Here is a pretty good picture of Nicky. Ocean loves to perch on the one across the room that you can not see here. She has never damaged it, but it's the first place she flies to. Nicky never flies. He stays where he's put, unless he gets on to the floor. He explores and chews anything that's on the floor. I put boxes down so he gravitates toward them. Last edited by Navre on Thu Feb 22, 2018 12:12 pm, edited 1 time in total. Nicky is going to have to have his nails done. He has one that just looks too long. He's also getting them caught in rugs. I actually think I might have the traveling vet who comes to the rescue come here to do it. He's not going to react well to it, but no travel, and me not being involved might help. I think that's the least stressful way for him. But why don't you or somebody in your household do it? It's not hard at all, especially if the bird is not afraid of towels, and, as it can be done quite quickly, it's not that much stress for them... I am going to do Nadia's nails later today because she has liver damage and, although they don't grow super fast, they do grow a bit too long and weird - kind of narrow and curly. As to the shot glasses display cabinets, I repeat, your birds are GOOD! I live in a constant battle to maintain the house looking 'normal'. Isis and Davy Redbelly are both terribly naughty birds! Isis chews the edges of the doors, paintings frames, books and any button she can find, both the clothing kind and the electronic device ones and Davy is into EVERYTHING! I don't know if all redbellies are like that or if I just happen to have two of the naughty ones... The senegals are not that bad but they love to chew the back of my draperies - and they are not cheap to replace!